If you intend to print a large number of reports in QuickBooks — and, more important, if you intend to print a large number of reports and show them to customers, investors, and other significant people — you want your reports to look good and to be easy to understand. Choose Edit → Preferences. Click the Reports & Graphs icon in the list on the left and then click the Company Preferences tab to see the Preferences dialog box for reports and graphs. 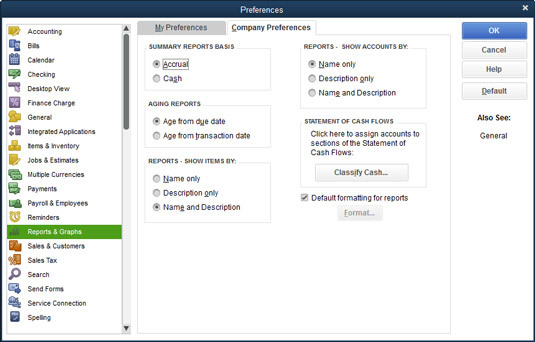 The Preferences dialog box for reports and graphs. Accrual: Accrual is one of those cruel accounting terms that can be hard to understand at first. If you select the Accrual radio button in the Summary Reports Basis panel, you tell QuickBooks to include all your transactions, sales, purchases, expenses, and so on, from the moment they’re recorded, not from the time you receive or pay cash for them. Accountants follow the accrual method because it gives a more accurate picture of profits. Also, the Internal Revenue Service (IRS) says that big corporations must use accrual accounting for their tax returns. Cash: If you select the Cash radio button, all the financial transactions in your reports are counted at the time you make your expense payments and you receive your customers’ payments. Age from Due Date: If you select the Age from Due Date radio button in the Aging Reports panel, QuickBooks counts your expenses and invoices from the day that they fall due. Otherwise, QuickBooks counts them from the day they’re recorded. Reports – Show Accounts By: You select a radio button in the Reports – Show Accounts By group to indicate how you want QuickBooks to arrange account information on your reports: by name, description, or both name and description. Statement of Cash Flows: You click the Classify Cash button to tell QuickBooks how it should handle its accounts when it produces a picture-perfect statement of cash flows using generally accepted accounting principles. A suggestion? Leave this for your CPA. Format: Clear the Default Formatting for Reports check box and then click the Format button if you want to improve the look of your reports. In the Report Format Preferences dialog box that appears, you can use the Header/Footer tab to choose preferences for displaying the company name, the report title, the subtitle, and so on. You can use the Fonts & Numbers tab in the Report Format Preferences dialog box to choose preferences for displaying numbers, decimal fractions, and negative numbers. You also can fool around with different fonts and point sizes for labels, column headings, titles, and other things in your reports. 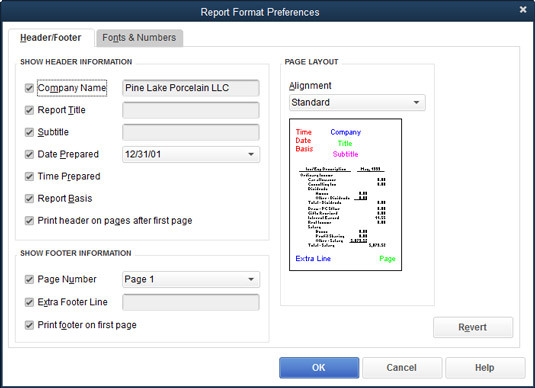 The Report Format Preferences dialog box. Click the Revert button in the Report Format Preferences dialog box to undo your customization changes.